British Prime Minister Theresa May says her Conservative government plans to scrap years of cost-cutting austerity policies introduced after the 2008 global financial crisis. She told the Conservative Party conference on Wednesday that next year, after Britain leaves the European Union in March, “we will set out our approach for the future,” with spending on public services going up. British Prime Minister Theresa May says divorce negotiations with the European Union are entering the “toughest phase” as she urged her divided Conservative Party to stop bickering over Brexit and back her plan for a future trade deal. Prime Minister Theresa May says leaving the European Union without a divorce deal would be “tough at first” for Britain, and “a bad outcome” for both sides. May is urging her fractious Conservative Party to unite and help her seal a deal with the bloc. With just six months to go until Britain leaves the bloc on March 29, talks are stalled and a powerful pro-Brexit faction in May’s party is urging her to be tough and, if need be, walk away without a deal. 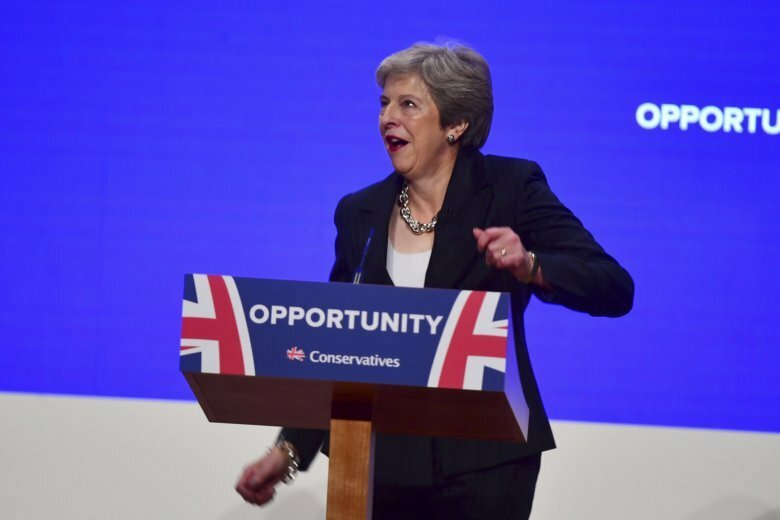 In a speech to the party’s annual conference Wednesday, she says “leaving without a deal – introducing tariffs and costly checks at the border – would be a bad outcome for the U.K. and the EU” — though she refused to rule it out. She says it would be tough at first but Britain’s “resilience and ingenuity” would see it through. Prime Minister Theresa May is urging her fractured Conservative Party on Wednesday to unite behind “decent, moderate and patriotic” policies, a day after her rival Boris Johnson trashed her Brexit plan and challenged her authority with a crowd-pleasing speech of his own. The four-day conference has been dominated by divisions over Britain’s impending departure from the European Union, with pro- and anti-EU camps both criticizing the prime minister’s negotiations with the bloc. Just six months before Britain leaves on March 29, negotiations with the EU have ground to a halt and May is caught between Brexiteers like Johnson and those who want to keep close economic ties with the bloc, Britain’s biggest trading partner.